The robust dependable DeLaval LVP is designed for dairy farmers demanding the utmost in performance. With a capacity range of 3000 to 6000 l/min and minimum maintenance requirements, this pump delivers true heavy duty vacuum supply. Built on lobe pump technology, the DeLaval LVP range helps protect the environment because no oil is needed for sealing or lubrication. With DeLaval vacuum pump LVP, reliability comes built in. It has to, because without vacuum your milking system comes to a standstill. Utilising efficient and well-proven vacuum and motor technology, we draw on the decades of vacuum experience we have here at DeLaval. Due to the special design of the pump head, the maintenance requirement has been reduced to an absolute minimum, saving your operating costs. Each pump head is also quipped with a cleaning device. Any residue can be quickly and simply removed, removing any need for dismantling and avoiding down time. The pump is designed to be both heavy duty and environmentally friendly. Lobe pump technology ensures that the environment is left undisturbed – no oil is needed for sealing or lubrication. 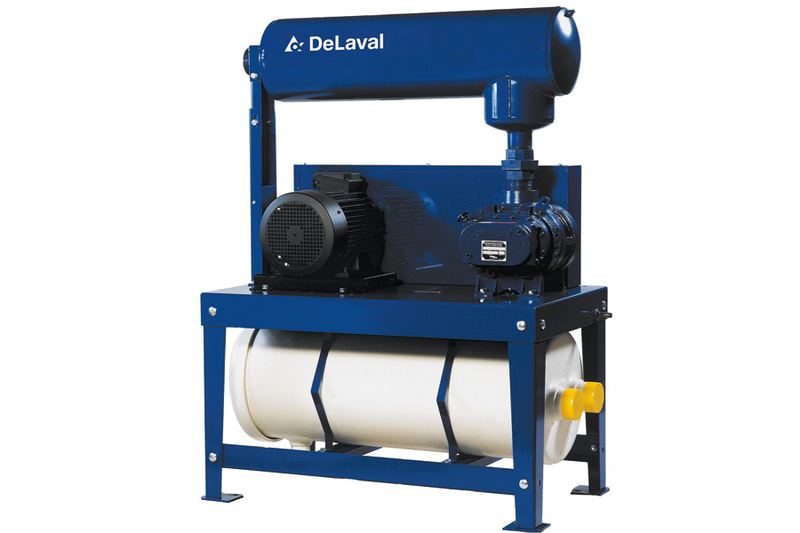 DeLaval vacuum pump LVP draws in the same air as it pumps out; air that is kept clean and free from oil. With built-in noise reduction the LVP range is also quiet, leaving you to milk undisturbed. The pump head includes two figure-eight lobes, rotating in opposite directions. With every rotation, a constant volume of air is transferred. Unique to DeLaval the LVP has a discharge plenum chamber, situated at the pump head outlet. This special feature gives you a much smoother and quieter run. Timing is controlled by the discharge gearbox. Exclusive on today´s market, this gearbox has been designed entirely for vacuum application and ensures that exact clearance is maintained. Since the closely-aligned lobes never touch, no lubricant is required within the pump unit itself. The highly-efficient distribution tank filter protects your investment even further by filtering out particles larger than 10 microns, which can be harmful for the pump. All these aspects mean operating efficiency under tough conditions, saving you from downtime and maintenance costs. And because DeLaval vacuum pump LVP comes pre-assembled, it can be installed between milkings and is ready to go to work as soon as you are.